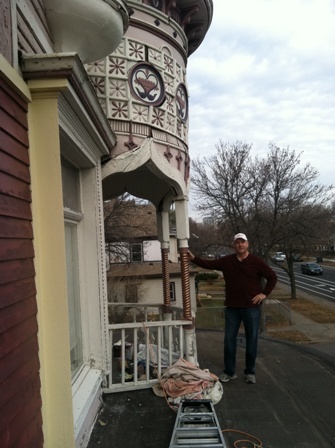 Mike Gustafson walked onto the roof and pointed up at the majestic onion dome that has crowned the Bardwell-Ferrant house for more than a century. “I just don’t want this thing to fall down,” said Gustafson, who bought the house in June. Indeed, one of the house’s two towers is leaning, alarmingly, ­toward Portland Avenue. 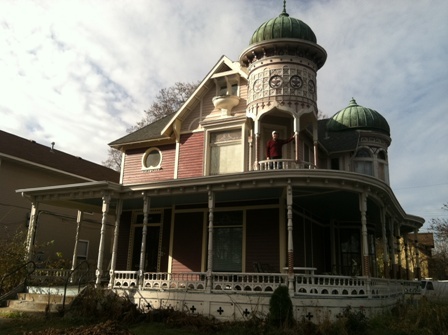 Built in 1883 and retrofitted in 1890 in Moorish Revival style with two towers, keyhole-shaped windows and spiraled columns, the Bardwell-Ferrant house is so distinctive that it resides on the National Register of Historic Places. But 129 years of history have not always been kind to this landmark in the Phillips neighborhood of Minneapolis. Gustafson, 52, a painting contractor who has had his own ups and downs, has neither the money nor the skills to repair his ailing dome. He’s hoping the fortunes of the Bardwell-Ferrant house will soar once again when more people find out about its current predicament. After all, it has been rescued before. The house was ­originally built in 1883 in a restrained Queen Anne style on a lot at 1800 Park Av. S. The first owner was Charles Bardwell, an owner of Bardwell-Robinson Sash, Door and Millwork Co. Seven years later he sold it to Emil Ferrant, who in turn hired a local architect, Carl F. Struck, to add “exotic” ele­ments that were enjoying a brief fad at the time. In 1898, the house made way for an apartment building and was moved to its present location at 2500 Portland. Since then, its rounded porch, keyhole-shaped stained-glass windows and, most strikingly, two whimsically carved wooden towers with copper helmets have stood out among the ­solid but unremarkable homes around it. As the neighborhood lost its allure, 2500 Portland became a rooming house. About the time of its 100th birthday, the house was vacant, a hole in its roof leaking onto hardwood floors, when a pair of real estate investors and old-home enthusiasts spotted it. They spent $160,000 to renovate the house, restoring such details as its original spiral posts, and turned it into four apartments. The rescue brought the Bard­well-Ferrant house into the 21st century, but its troubles weren’t over. The investors sold the house in 2001, and less than a decade later, a bank foreclosed on it. Thieves pried off three elaborate mantelpieces and carried them away, and damaged one of the few original stained-glass windows that remained as they tried in vain to steal it, too. They also ripped out the copper pipes from the furnace and baseboard radiators. Meanwhile, a neighbor was going through his own tribulation. Gustafson had lived for 18 years at 2501 5th Av. S., but he had landed in financial trouble when the collapse of the construction industry took most of his painting business with it. In 2011, the bank repossessed Gustafson’s house. But he found a new place just across the alley. He and his wife bought the Bardwell-­Ferrant house and moved in with their extended families. He has started to remove partitions and make other changes to restore it to a single-family house, but aside from a good paint job, he’s limited in what he can do. The scars where woodwork was torn out still pain him. All he has are black-and-white photographs of the old mantelpieces that he found on the Internet. That sympathy extends to government and nonprofit advocates for historic preservation, but no one knows yet whether someone can ride to the rescue of the leaning ­tower. Erin Hanafin Berg, a field representative for the Preservation Alliance of Minnesota, and Aaron Hanauer, a city planner who staffs the Minneapolis Heritage Preservation Commission, said they were interested in talking to Gustafson about his situation. 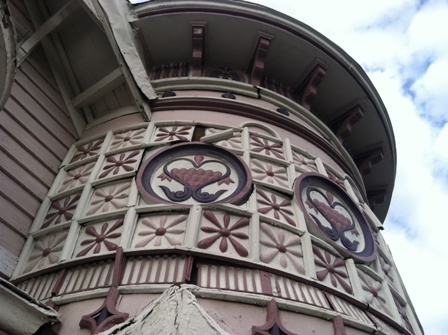 “Given the historic and architectural significance of the Bardwell-Ferrant house, the owner might have some luck getting an area ­nonprofit or the city of Minneapolis to partner with him in stabilizing the domes, or at the very least in hiring a structural engineer and/or contractor to develop a plan of action,” Hanafin Berg said in an e-mail. Hanauer said a number of nonprofits and neighborhood groups might help, but “there isn’t any specific city program dedicated to help preserving local landmarks.” The city used to give property tax relief to those who renovated old houses, but that program went away more than six years ago, he said. If the tower becomes a safety hazard, however, city housing inspectors would get involved, Hanauer said. Gustafson hopes it won’t come to that.